There are always things to be missed when you make changes to your diet. For me, I used to miss some of the traditional “comfort foods.” You know, Mac & Cheese, spaghetti with meatballs, battered chicken… I could go on and on. It’s not often that I miss these things, but when I do, I am always thinking of ways I can come up with a Paleo and healthy version. Usually, it becomes too exhausting to ponder, so I end up just leaving it alone until the next time I get the cravings. Just the other day, these cravings occurred again. I was determined to satisfy them, so I quickly came up with a recipe for Beef Stroganoff. Beef Stroganoff is a traditional Russian dish usually prepared with beef, white wine, sour cream, mushrooms and onions. It really didn’t require much thinking on my part to adapt the recipe to a healthy version, as I would simply substitute the sour cream with coconut milk and completely eliminate the use of flour (since all it does is thicken the sauce, not alter the taste). I decided that if I felt the need for a noodle base for the dish, I would roast a spaghetti squash, or whip up some zucchini noodles, nothing complicated. I recall my mother and grandmother making this dish when I was a child, and I know that they never used the same cut of meat. It really just depended on what they had from leftovers, or what was available from the local butcher. It’s commonly prepared with stewing beef and top sirloin and nowadays it has even become popular to drop the beef completely and use chicken or pork instead. I opted to use a top sirloin steak. This is a fairly flavourful and tender cut of meat for the price. Unless I’m cooking a piece of meat on its own, I tend to select a cut that is a little on the cheaper side. I do this because there are plenty of other flavours incorporated in the dish that can easily override the taste of the steak, so it really does not make that much sense to pay for the best cut. I’d rather use the money saved on a cheaper cut to buy grass-fed beef instead of the traditionally raised kind. This is not in any way to say that quality does not matter, as it totally does. But if you are familiar with meat you will know that the cut tends to determine the taste and tenderness, which in turn has an impact on price and this no matter if the animal was raised properly or not. For an interesting variation, you could also try preparing it with bison or venison. I also highly recommend leaving on the fat from the meat, as this creates that much more great flavor in the resulting dish and is very healthy for you. 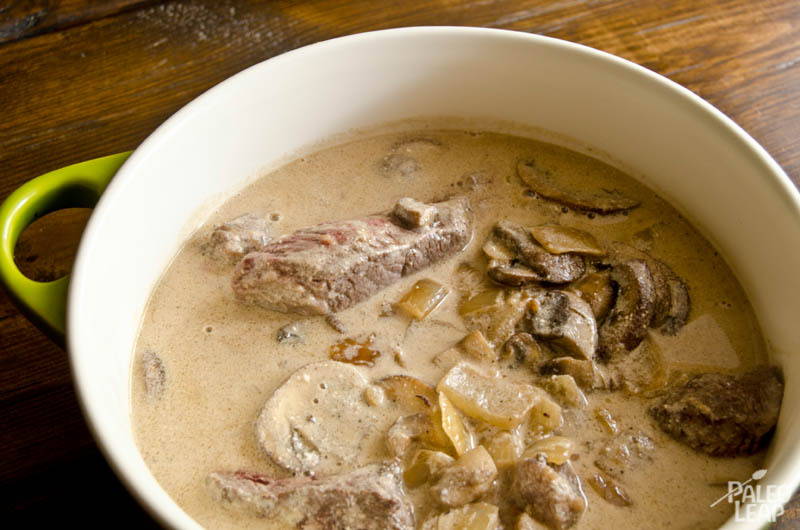 This beef Stroganoff recipe is definitely very delicious and satisfying. It’s always a good idea to prepare more and use leftovers in the following days because you’ll probably want to enjoy the rich taste more than once. 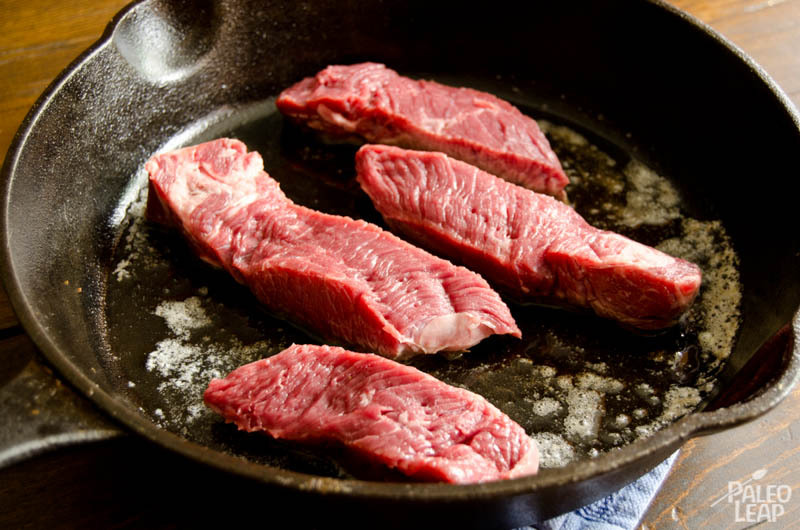 Heat a large skillet (preferably cast iron) over a medium-high heat and allow 2 tbsp of your cooking fat to melt. Add the beef strips and cook on each side for just one minute, until golden brown and then remove from the pan and set aside. Don’t be worried that the meat isn’t cooked through, as it will return to the heat to cook again later. Repeat the above step, but this time cooking the mushrooms. They may require a minute or two longer, just enough time so that they begin to take a golden color. Once cooked, remove them from the skillet and set aside for later use. This time, repeat the first step, but with the onions and garlic. More cooking time will be required, as the onions need to become tender. Once the onions and garlic have cooked, leave them in the skillet and add the white wine. Cook for just a few minutes so that the alcohol burns off and the brown bits stuck to the bottom of the pan come up. At this point add the coconut milk and beef broth, stirring until a consistent creamy sauce takes shape. Return the beef and mushrooms to the skillet and allow them to simmer slightly for 5 to 7 minutes. You may need to turn the temperature down to prevent the sauce from boiling. Also be sure to check the beef, as you do not want to overcook it and make it chewy. Serve as is or on top of some spaghetti squash or zucchini noodles. Bon appétit!